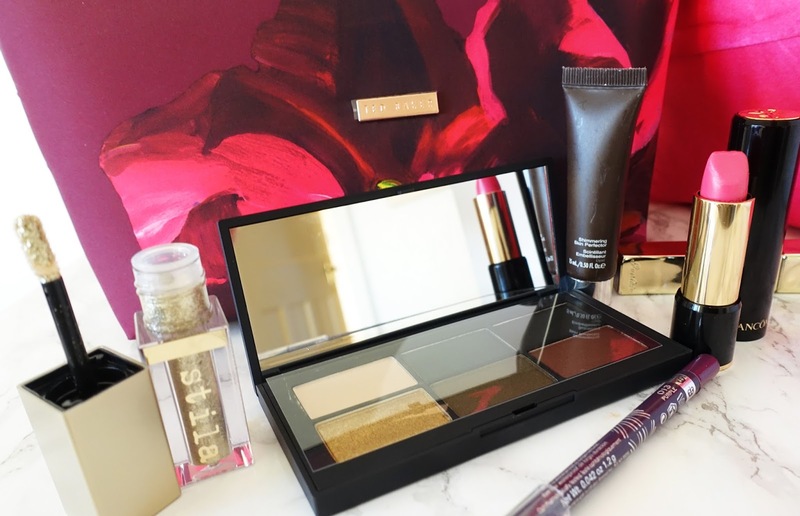 What's in my make-up bag? | Is This Mutton? The bag itself is from Ted Baker and I also have a separate one just for lipsticks and lip products. I would divide my make-up into three distinct looks: 1) The bare essentials, for when I'm working from home, or at the weekend; 2) Work face and 3) Full Face. The bare essentials for me is a good concealer, a small amount of blusher, and a little tidying of the eyebrows. Don't under estimate the power of pencilling in your eyebrows. They really lift the face. I've found Revlon's Colorstay brow pencil very good. It has a brush at one end, so I brush the hairs up; then I use the pencil end to create tiny hairs. I sometimes remember to brush on some clear Anastasia brow gel which helps to set the brows and stop any movement. I've been using Amazing Cosmetics "Amazing Concealer" for a while. It's a cream concealer with good coverage (you only need a little). I have it in two shades and as I get slightly tanned in summer, I mix the two together. I apply a little to my hand and use a brush to dab it on my under eye circles. And the blusher that I have used on and off for years is Nars's The Multiple, in shade Portofino. Its name suggests you can use it for other purposes but I've only ever used it as a blusher. When I'm in the office or going to a conference, I'll do a "full face." This requires a bit of prep to start with. I think of my face as a canvas that needs to be primed, to fill in the lines. After applying Sarah Chapman Skinesis Morning Facial, which is a lovely serum that ends any dryness from cleansing, I apply moisturiser and then two primers: Laura Mercier's foundation primer and for my eyes, Urban Decay Eyeshadow Primer Potion. Foundation goes on so much better over a primer, but you need to find a good one because sometimes they "pill" and you find during the day that your make-up is starting to flake off. The Laura Mercier primer, which comes in different varieties, doesn't do this. I apply a little foundation to my thick Sigma round kabuki brush and apply it firmly to my face, mainly on the cheeks to cover pigmentation and on the nose to cover any redness. 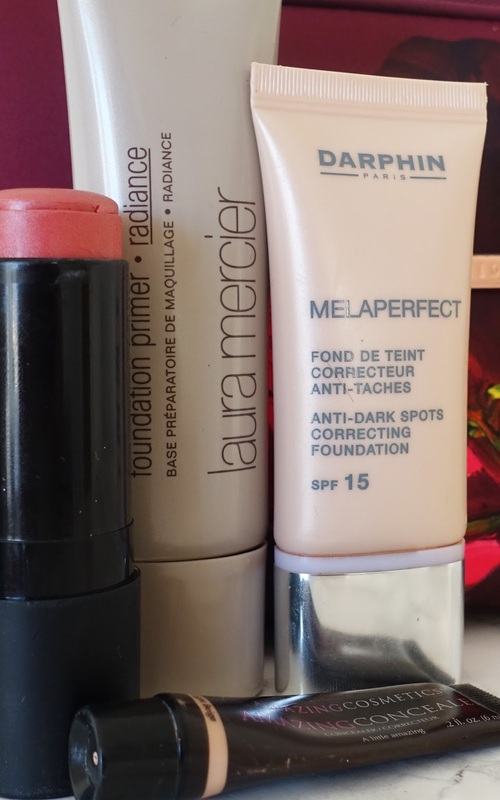 My foundation of choice is Darphin Melaperfect anti-dark spots correcting foundation. It does what it says on the tin but isn't too heavy. I keep the coverage light: if you plaster too much foundation on, it settles in lines and makes you look older. The eye primer takes away the dark tinge of my eyelids so I usually wear it on its own. Sometimes, if I add eyeshadow to my work face, I might use a very pale cream or pink Urban Decay shadow. I always curl my eyelashes, using a Shiseido eyelash curler. This is so effective, along with RapidLash used at night time to make your eyelashes grow, that I don't always bother with mascara. So "fancy face," for evenings out or when I'm doing a "shoot," is a work face plus some lipstick and a bit more drama on the eyes. In the image above, I've shown my current favourites for eyes. I use Stila Magnificent Metals Glitter & Brow Liquid Eyeshadow in gold goddess as a glittery eyeliner, having applied a light colour on the lids. I have a fabulous new palette from Nars which is so gorgeous I'm loathe to use it. I might add a little eyeliner beneath the lower lashes - the Rimmel ScandalEyes waterproof kajal in purple is a good shade if you have blue or green eyes. I'll finish off with a black mascara and I like to use a waterproof one in case of rain (!) - Eyeko Sport Waterproof Mascara is very good. I don't wear lipstick very often because I find the constant re-application drives me crazy. I use a primer (no surprises) - Guerlain's Lip Lift - which stops lipstick from bleeding over the edges and gives a smooth base for your lipstick. I like a fuchsia pink or bluey red lip - I'm showing a Lancome sheer lipstick in Rose Printemps. A highlighter is a "must have" for the fancy face. I'm using a sample of Becca's Shimmering Skin Perfector. It's a pearly cream that I tap along the top of my cheekbones, apply a thin stripe down the centre of my nose to slim it, a little above the cupid's bow, and a dot in the middle of the chin. Highlighter, used in a subtle way, restores some of the radiance we lose as we get older, and can bring areas of the face forward or reduce them. I don't ever use contouring products - leave that to the millennials! Years ago we never bothered with make-up brushes, did we? Eyeshadows came with little sponge applicators and we tended to use our fingers. But I always use brushes now - I can't bear the sticky feeling of make-up on the fingers. 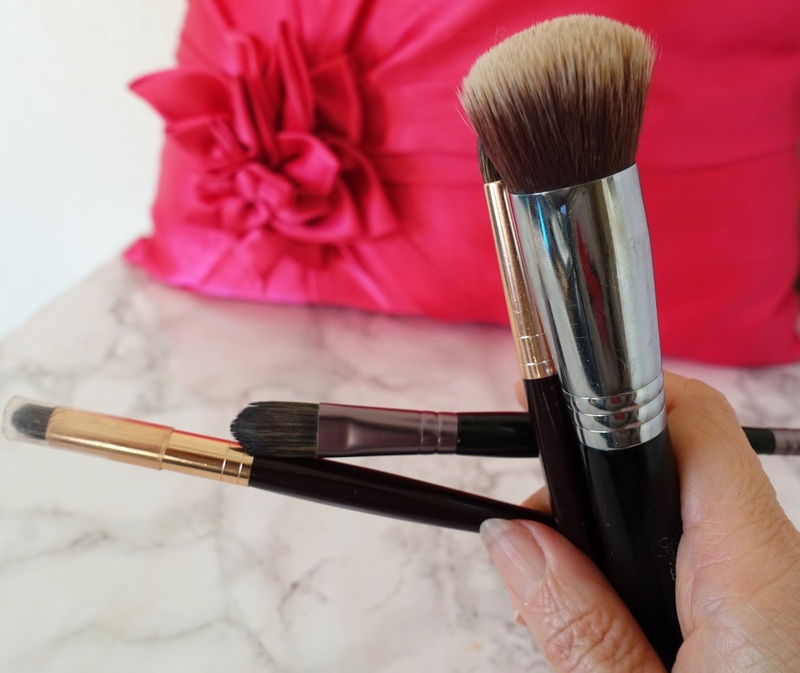 I have a couple of Charlotte Tilbury brushes for eyeshadow and smudging; a useful double ended brush from Studio 10, which I use for applying concealer, and the foundation brush I mentioned. So that's my make-up bag - I'd love to hear if you use any of the same products, or if you can recommend any others. Please share in the comments below. Such a great set of products! Have a lovely weekend. I'm also fascinated by other people's make up bags so it's nice to get a peek into yours. I can't confine myself to just one bag so I have a series of them, and a system that only makes sense to me. The things I use that are probably different to you are eyebrow products (I'm very fair so need to draw them in) and lip liner, which I find makes a big difference to how long lipstick lasts. I always use a lip liner and fill in. and then lipstick over the top. This seems to keep the lipstick there more or less all day Gail. I might have to give the primer your using a go, that sounds very good too.